Yamaha Vintage Analog is a keyboardist's dream collection of classic Yamaha analog instruments including the CS-80 and CS-01 Synthesizers, SK50D Symphonic Ensemble, CP-30 Electric Piano and the legendary GX-1 Electone Synthesizer. And the provenance of this particular GX-1 that we recorded is particularly exciting: We recorded the most famous GX-1 of them all, the original instrument used by John Paul Jones with Led Zeppelin that he sold to Keith Emerson of ELP which then went to iconic film composer Hans Zimmer. In addition to the many GX-1 sounds recorded, this collection also includes both the electric piano and harpsichord from the super warm and vibey CP-30 Electric Piano along with lush strings from the SK50D Symphonic Ensemble, plucky basses and PWM pads from the small-but-mighty CS01 and gigantic tones from the monstrously beautiful CS-80. This vintage collection is truly like no other and an absolute must-have for your sonic arsenal. It has been a real privilege to create this fantastic new library for the Motif. We all know about vintage Moog, Oberheim, ARP and Sequential Circuits synths, and these have been presented in vintage sample libraries time and time again. But the amazing analog instruments from Yamaha are often overlooked in vintage collections, and we ve taken some big steps to correct that with this new library that focuses solely and specifically on these classic analog instruments from Yamaha. Surely the most famous Yamaha analog synth is the prestigious CS-80 which was produced for only a few short years in the late 1970s. You have heard the CS-80 in countless classic tracks in all musical genres from this era and through the 80s as well as in groundbreaking electronic film scores like Vangelis "Blade Runner" and Toto's "Dune." Yamaha has an unrivaled tradition for extensive research and development efforts, and the CS-80 is physical evidence of this. Rather than build a cheap-as-possible everyman keyboard, Yamaha built a true "musical instrument" to be at the summit of synthesizer technology, build quality and musical expressiveness. Weighing in at over 200 lbs., it is clear that Yamaha did not cut any corners with this analog masterpiece. Perhaps the most unique thing about the CS-80 is its audio path. Unlike Moog, Oberheim and other analog synths of the same period, the CS-80 has a dedicated audio path for each oscillator. Other manufacturers mixed their oscillators prior to going into a single "per voice" filter; The CS-80 quite contrastingly provided a dedicated high pass and low pass filter for each oscillator. Interestingly enough, this layout is remarkably similar to the multiple "Element" architecture in the current Motif instruments, the CS-80's modern-day descendants! Following that thinking, in our Motif sound library we have provided many single oscillator Waveforms that you can combine using the 8 Motif Elements per Voice to faithfully reproduce this circuit topology. The CS-80 also gave you the ability to combine the waveform outputs of each oscillator, another thing that set it apart from many other analogs of its day. Serious synthesists know that by combining a sawtooth wave with a pulse-width-modulated square wave, you can convincingly generate the tone of two oscillators beating against each other from a single oscillator. The Yamaha engineers knew this well, and they provided that functionality in the CS-80. And they did something especially interest with the Sine wave output. Rather than putting it as part of the pre-filter waveform mix, the CS-80 Sine wave output actually appears after the filter. This makes perfect sense from a purist engineering standpoint since the sound of a pure sine wave will not be affected by a high pass or low pass filter unless you filter past its fundamental frequency … which will simply turn it down in volume or make it disappear altogether. So why add extra circuitry, extra noise, distortion, etc. by passing the sine wave through the filter? A rhetorical question, of course. It makes so much more sense to simply bring up the sine wave post-filter to mix with the other filtered waveforms. Again, this is something that the Motifs can recreate quite well with their 8 Element architecture. In our Yamaha Vintage Analog library, we have also provided some pre-programmed mixes of sawtooth and sine Waveforms and also PWM square and sine Waveforms to more quickly get you to the classic CS-80 tonality. Can you imagine the behemoth CS-80 as a "light version?" 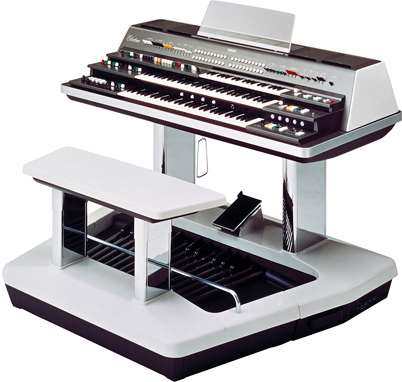 It sound preposterous, but in many ways, the CS-80 was a scaled-down version of the massive GX-1, a rare console instrument with three keyboard manuals plus bass pedals, each with their own tone generators. The two main keyboard manuals were 8-voice polyphonic like the CS-80 would be, and the top solo keyboard and bass pedals were monophonic. Using the same architecture with a dedicated HP and LP filters per oscillator (not per voice, but per oscillator -- again, like the Motif's Element architecture), this adds up to 36 oscillators across the instrument! While the CS-80 weighs over 200 lbs., just the console section of the GX-1 weighs over 600 lbs! It is incredible to think that artists such as Keith Emerson and John Paul Jones took their GX-1 synths on the road. And speaking of Keith Emerson and John Paul Jones, wouldn t it be incredible provenance to have samples from their actual instrument? As history would have it, Emerson actually purchased Jones GX-1 to use as a second unit when Emerson's first GX-1 came off the road a bit worse for the wear. That most-famous GX-1 can be spotted in classic film footage of both Led Zeppelin and ELP. And if that history is not impressive enough, Emerson later sold this GX-1 to landmark film composer, Hans Zimmer, in Los Angeles before it was re-sold again to anonymous private party collectors. There were some fortuitous points within that storied history when we were able to sample this specific instrument, the actual GX-1 owned and played by these legendary artists. Some would call that "serious mojo." But what about the sound of the GX-1? If you played the pedals, the solo keyboard and the two main manuals simultaneously, you could literally sound the equivalent of 4 CS-80s playing one note. And the GX-1 actually provided a link between the two main manuals so that you could layer the equivalent of two CS-80s with 8-voice polyphony. We have provided several Waveforms of those layered GX-1 stacks in our Motif library. A signature sound of both the GX-1 and the CS-80 is the pitch scoop at the beginning of note. This could be done with the ribbon controller, of course, but also automatically on the GX-1 with its Auto Pitch Bend switch. We have provided samples of this Auto Pitch Bend in our library to realistically recreate that classic sound. And we have also included samples of the same sound without the pitch bend so that you switch between the two articulations or even layer them together for super fat brass and pad attacks. From the heaviest vintage analog synth to perhaps the lightest, we now move to the much-loved CS01, a super-compact monophonic lead synth from the early 1980s. It is not exactly one CS-80 oscillator, but the approach is somewhat similar, especially when sampled. On its own, the CS01 could produce punchy analog basses and lead sounds with its snappy envelope and real analog sound source. But when sampled, multi-oscillator CS-80 style configurations are instantly possible, and that's what we have provided in our Yamaha Vintage Analog library. We sampled the same panel setting with the sawtooth wave, then the PWM square wave and then with noise as the oscillator output. We even recorded some sweeping filter samples to truly capture the instrument, again, with all three oscillator sources. And the unit we sampled was the most-desired version, the CS01II, with the improved filter circuit. This sampling approach was custom-designed for the Motif architecture where you can combine up to 8 Elements per voice. When you hear the CS01 sawtooth Element panned left combined with the PWM square Element panned right with a third noise Element added in, you won t believe how fat and enormous this little analog gem can sound. No, not C-3PO from Star Wars, but another electronic legend released around the same time, the CP-30! Designed to be an electric piano using analog synthesis technology, the CP-30 is known for its warm tones and rich stereo effects. It also offered a classic harpsichord sound that will instantly transport you back the 70s. We have included both electric piano and harpsichord sounds in our Motif library, and like all of the other instruments we sampled, we recorded this one with the Motif multi-Element architecture in mind. The CP-30 had a fairly expressive velocity sensitive keyboard that would brighten the tone, essentially opening the filter. But that filter has a very specific sound, so we sampled it at different velocities to accurately recreate the CP-30 feel. The CP-30 chorus is also an essential part of its stereo sound, and the Motif effects do an excellent job of recreating that vintage vibe. We of course tried all options, but we chose to record the CP-30 without its internal chorus to preserve the correct phase relationships between each note. The sampled chorus sounded wonderful on individual notes, but when you would play chords with the chorus in different positions for each, it just sounded wrong. The Motif effects provide so many excellent chorus options, from the basic G Chorus to the rich Yamaha signature Symphonic effect, we recreate the CP-30 stereo image that way, and with significantly more flexibility. How many artists had the opportunity to combine all of these legendary Yamaha analog instruments on a single track or even layered together as a single sound? Very few to be certain. But with the multi-Element architecture of the Yamaha Motif and this library, you can do what only an elite group could do before, and surely with more accuracy, reliability and control. 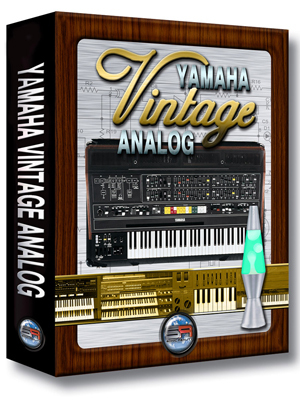 Our Yamaha Vintage Analog library provides a great set of carefully-crafted Voices for instant use. But you can take this sound set into near-infinite possibilities with just a little programming of your own. Try just simply swapping out the Waveforms on the provided Voices to start, or even build your own Yamaha Supersynth from scratch. You'll reach new sonic heights in no time at all with a truly unique set of tones that is definitely not found in every other synth on the market.